McCoy’s is Still the Real Deal and Then Some! Today I am sharing my recent dining experience at McCoy’s Oceanfront Restaurant. Located inside the Marriott Pompano Beach, the resort’s signature beachfront restaurant and lounge pays homage to its Prohibition-era namesake. Some of you may recall a post I did on McCoy’s back in April of last year when I was still blogging under BocaFoodFinds. New year, new blog and new Executive Chef at McCoy’s. His name is Eric Kaszubinski and he has been with the Marriott chain for like a gazillion years. Chef Eric was appointed Executive Chef of McCoy’s this past April and has been turning up the heat and blazing a new trail in the food and beverage scene ever since. Chef Eric oversees the culinary execution of the resort’s food and beverage program, which includes McCoy’s Oceanfront, in-room dining and catering for meetings and events. My dining companion and I were greeted at our table by Chef Eric who took the time to share with us his journey here and how excited he is to be able to explore his creativity and applying his love of the ocean to the dishes they’re serving in McCoy’s. He goes on to tell us how Pompano Beach has so much to offer by way of fresh, local ingredients and that it gives him such pleasure to live here and to be able to give guests a taste of this great city. Chef prepared a variety of items from their lunch menu for us to taste. While we waited, we were presented with a cocktail & wine list. After scanning the menu up and down, my eyes kept returning to the Harlemese Sangria, a beautiful drink comprised of Chateau St. Michelle Riesling, fresh fruits, St. Germain Elderflower liqueur and garnished with HUMONGOUS blackberries, fresh strawberries and mint. It was practically a meal in itself. The first item the Chef brought out was the local fresh ceviche. The fish changes daily and on this day, we delighted in the Corvino which sat in a bath of coconut, rum and slivered red onions (a little too many onions for my liking) served with some lovely plantain chips; but overall, the dish was very flavorful and we both liked it very much. Next item to hit our table was the Ale Braised clams. These clams happen to come from Cedar Key and were accompanied by pork belly and a broth made with Cigar City Maduro craft beer, garlic and fennel. First of all, full disclosure, I’m not a huge fan of steamed clams (or oysters or mussels for that matter). These clams were a little bit on the small side and my companion and I decided that their choice to stay local probably had a lot to do with that. Aside from the size, the combination of flavors and the other components on the plate certainly made up a well balanced dish. We both agreed that the broth resembled something of a French Onion soup-type flavor, which we both thought was delicious. As part of its commitment to sourcing fresh, local products, McCoy’s is now home to an Urban Garden, located at the front of the restaurant, where fresh plants and herbs grow and ultimately make their way into the dining menu. McCoy’s has partnered with Tampa-based Uriah’s Urban Farm to source local products. Plants are changed weekly and Chef Eric is more than happy to guide guests through the uses for each. We had the opportunity to sample the fresh from the garden Strawberry & Citrus Salad made with arugula, fennel, orange, pistachio, feta cheese and tossed in a citrus vinaigrette. It was very light and well composed and just screamed FRESH!!! Undeniably one of our favorite items we tasted throughout the day was this scrumptious crispy Rock Shrimp tacos. Served in a corn tortilla with an avocado “butter” (I’d say a more accurate description for this “butter” might be avocado crema), jicama slaw, and tossed in a sweet Thai sauce. The shrimp are from Florida. The shrimp were cooked to perfection. They were crispy but not laden in a heavy batter. I can’t believe I’m saying this, because I’m usually the biggest wimp in the world when it comes to heat, but…they could stand to add a little heat to the sweet Thai sauce. The lovely jicama slaw would be right there to help soothe some of that heat. But believe me, this is a super delicious dish as is. Now, having just returned from New England, I had “chowda” on the brain. I saw this offering on the menu and asked Chef Eric if it would be ok to try his version. I’m sure glad we did. It exceeded both our expections ten-fold. It was chalk full of seafood – ground conch, rock shrimp and local catch (in this case the Corvino was used) along with sofrito (A colorful blend of red, green, orange, and yellow bell peppers, tomatoes, green onions, tomatillos, and garlic), veggies, potatoes, saffron and rum. One other item that caught my eye, which wasn’t on the lunch menu, but was featured as a starter on the dinner menu was the local burrata, tomato jam (with caramelized red onion), fig balsamic & lemon oil. Had to have it. So happy Chef Eric was able to accommodate. Yay! It was terrific. A must-try for sure. And speaking of dinner menu: highlights from the new dinner menu include the Ale Braised Clams with pork belly, garlic and fennel (pictured above); Florida Pompano with sautéed fingerling potatoes, grilled asparagus, wilted greens and lemongrass herb butter; Farro Risotto with day boat scallops, gulf shrimp, English peas, summer squash, baby spinach and pancetta; and Lake Meadows Chicken with haricot verts, goat cheese polenta and her jus. We concluded our tasting with the Black Forest Cheesecake, which you can have for either lunch or dinner (who knows, maybe you can even have for breakfast if you ask Chef Eric nicely enough) lol. This little masterpiece is made in house and has a delicious oreo crust and bourbon cherries. It was rather addicting. I want to thank Chef Eric for really extending himself and providing my guest and I with a wonderfully personalized tasting experience. One that we will remember for a long time and new memories we look forward to creating there in the future. Chef Eric recently rolled out brand new breakfast, lunch, dinner and happy hour menus. If you haven’t been to McCoy’s or if it’s been a while, I highly suggest you head on over and give them a try. I know there are so many choices to go, but trust me on this one, it’s a great find. McCoy’s is located 1200 N. Ocean Blvd. in Pompano Beach, just south of the 14th Street Causeway inside the Marriott, right on the beach. For more info, you can visit their website or call (954) 782-0100. I apologize for the delay in posts…didn’t mean to keep you hangin’, lol! So where did I leave off? Oh yeah, I had just wrapped things up in Portland and was heading up to Bar Harbor. I decided to take the scenic route 1, as I was told there were numerous quaint towns along the way that I should check out. I can’t reiterate enough how much fun I had driving this Mini Clubman (courtesy of Mini of Peabody) up the coast. This car was made for hugging the winding road and I felt so safe behind the wheel. I did pass through some quaint towns before making a stop at Rockland where I got out and explored a bit. This town definitely has potential for a future foodie tour. I wish I had more time, as I would have liked to stop in Camden, but it was getting late and I wanted to arrive at my Airbnb and meet my host Anny before dark. As I mentioned in earlier posts, I decided to become a first time user of Airbnb and when planning this trip to New England, I researched and selected to stay with these specific hosts which I have been highlighting along the way. Anny and I had communicated prior to my arrival so she knew more or less what time to expect me. She and Sweetie Pie, her lovely white Great Pirinese welcomed me into their home and showed me to my room. I was staying in the Ancestor’s Room, as Anny explained and pointed to all the photos of relatives adorning the walls. I didn’t have much time to chit chat that night as I had to get over to Bar Harbor to meet with Kristi (my Ops Mgr for our Bar Harbor tours). The drive from Southwest Harbor, aka “The Quietside” (compared to the hustle and bustle of Bar Harbor in season) into Bar Harbor at sunset was magnificent. The sun was going down over the lake and I could make out the silhouettes of kayakers in the distance paddling across the water. I was so excited to meet Kristi for the first time in person, after communicating with each other via phone and email for months. I was also super excited that she invited me to dinner at one of her restaurants, Cherrystones, which just so happens to be one of the stops on our Taste of Bar Harbor tour. For a starter, we had their crispy Brussels sprouts and OMG were they delish! Anyone who knows me, knows that my all time favorite Brussels come from Smoke BBQ in Delray Beach, with a close runner-up at The Office, also in Delray Beach. But after tasting these at Cherrystones in Bar Harbor, ME…I certainly have to rethink my hierarchy in which to base all future Brussels to. They were that good! We also enjoyed a couple entrees, and while the fresh fish dish was certainly fresh and tasty, the star in my opinion was the lobster carbonara, which included fresh picked Maine lobster sautéed with smoked bacon and a creamy carbonara sauce, served with penne pasta and topped with fresh chives. After a delightful meal and meeting, I said my goodbyes until the next morning when we’d meet up with our tour guide Jessica and do a walk through of our tour. The next morning, after luxuriating in the most magnificently updated spa shower at Anny’s (we’re talking a rain shower head from the top and pulsating jets on the sides and music…the whole shabang), I was served a lovely cup of tea and warm pastries. Anny is a great story teller and I was fascinated by the stories she shared with me in the short time we had together. Prior to opening her home to Airbnb guests, Anny had a pie business which she started at age 60 after finding it very difficult to find a job in a new town at her age. The business was called, what else…”Sweetie Pies”. Guests on this tour will delight in the delicious food with a view at The Fish House Grill where they will get a little clam chowda, lobster roll & an Old Soaker Blueberry soda tasting . The party will then move on, walking through historic downtown Bar Harbor viewing sights that include The Shore Path, Agamont Park and several historic Bar Harbor homes and, of course, a great view of Bar Island. Our local guide will share fun facts and interesting anecdotes about the town she is intimately familiar with and will impart some local insider’s tips as well. Next stop, Bar Harbor BeerWorks for a gourmet burger, fries & local Maine brew tasting, followed by a visit to either Peekytoe Provisions or Acadia Country Store where guests will get a live oyster shucking demo and/or tips on selecting the freshest seafood along with a tasting of some local seafood or products native to Maine. Onward to Cherry Stones for a taste of their famous cherrystone clams & some blueberry pie ala mode. Next, guests will be introduced to Bar Harbor Popcorn and learn how they make their popcorn, the various flavors they infuse, and tastes will be provided of their most popular blueberry and other flavors. Participants will be given an opportunity to purchase bags to take home with them. The tour will conclude at the now famous MDI Ice cream shop where Obama ate ice cream when he came to Bar Harbor, before returning to The Village Green, a beautiful park in the center of town. And there you have it. My wrap up of my 5-day adventure in New England getting my tours set up just in time for this season’s Fall Foliage cruises. So far the Norwegian Gem and the Dawn have experienced our Taste of Portland and by the time you read this, we will have passengers from the NCL Gem and the Oceania Regatta taking our tour in Bar Harbor. Private group tours are available in all these New England towns year round with a minimum of 10 participants. For more info on how we can plan a customized tour for you and your friends/colleagues, please contact me at info@SavorOurCity.com or (954) 410-3177. I hope you have been enjoying reading about my adventures in Boston (Part 1 and Part 2) and now the journey continues as I hop in my Mini (courtesy of Mini of Peabody – pronounced Peabiddy. Just thought you’d like to know so you don’t make the same mistake I did, lol) and head to the foodie town of Portland to meet my tour guides and have an enjoyable evening in the Old Port district. It was a bit overcast as I approached town but that didn’t deter me one bit. My Airbnb home in Munjoy Hill, a convenient location to the Old Port (Portland, ME) Although I did not get to see my host John, we had been in constant communication through text. I found the key exactly where he had instructed and everything I needed was there. He had parking for me at his home which came in handy also the next day when Marcia, one of my guides came to pick me up and took me for a short drive around the city before we embarked on our tour. One of the lovely scenic stops we made as we were leaving Munjoy Hill heading into Old Town Portland. Stroll through the Old Port, sampling your way through various restaurants and shops offering an array of delectable items that reflect Portland’s distinct cuisine. Your guided walking tour carves a path through the historic streets of the Old Port; an area that 100 years ago was home to canneries, factories and textile mills. Today, this warehouse district has been revitalized with dozens of quaint restaurants, coffee houses, bakeries and shops selling gourmet merchandise. Your local guide will introduce you to several of the finest Old Port venues to sample their wares. While the exact stores and restaurants always vary, you can be sure that the items will be heavily influenced by what’s fresh and indicative of the local cuisine. Some of these Maine-inspired foods may include Maine lobster, cold-water mussels, farm-raised lamb, organically grown vegetables, fresh-baked pastries and seasonal berry jams. It’s no coincidence that Bon Appétit magazine recently crowned Portland “America’s Foodiest Small Town” because there’s so much here to please the palate. As you sample the various culinary treats, the proprietors will elaborate on how they were prepared and where the ingredients were obtained. At the Porthole Restaurant & Pub – our first stop on the “Taste of Portland” tour. Guests will get a demonstration on how to crack open a lobster and have an opportunity to taste a lobster roll and clam chowder. Great location right on the pier. The Cabot Farmers’ Annex is the second stop on our “Taste of Portland” foodie tour. Here guests will have an opportunity to experience top shelf, award-winning cheddars and other local specialty items. Our third stop on the “Taste of Portland” tour is Dobra Tea. Set in a beautiful, tranquil environment, guests will have an opportunity to sample some teas and taste some locally made treats. What’s a visit to Maine without a taste of a whoopie pie? It is the state’s official treat. (Blueberry pie is the state’s official dessert). Here at East End Cupcakes tour participants will have the chance to do just that! Last but certainly not least is our stop to Vena’s Fizz House, a soda shop and cocktail lounge that creates the best drinks using high-quality, natural ingredients. Guests will be delighted and entertained by owner & mixologist Steve Corman or one of his staff. Vena’s is a one-of-a-kind Mixology Shop, Natural Soda Bar, and Cocktail Bar catering to kids & adults of all ages. Click here to watch this cool video. The “Taste of Portland” tour is available for private groups of 10 or more. 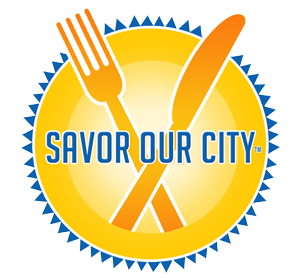 For additional information or a quote, please contact us at info@SavorOurCity.com or (954) 410-3177. Following your visit to Quincy Market & Faneuil Hall, you will walk to nearby Boston Public Market, another indoor haven for foodies that opened its doors in the summer of 2015. The market houses 39 year-round vendor stalls which must sell food and other products that are produced or originate in New England, specializing in items sourced from local farms and fishermen. Your guide will share historical facts, interesting anecdotes, and some local insider’s tips as you sample dishes and delicacies that reflect the area. Some of the iconic New England delicacies sampled along the way include an award-winning clam chowder, lobster roll, cheese, chocolate, nuts, honey, fresh fruit vinegars, wine, mead (honey wine, the oldest alcoholic drink known to man). Then, it’s on to the Parker House, your final stop and birthplace of the city’s iconic Boston Cream Pie, which you will have the opportunity to sample. Red’s Best Retail Manager Valerie with Red’s owner Jared sharing some interesting info on sustainability and the process of catching the fish and bringing them to market. Interested to know where I stayed while in Boston? Click here for the Best Boston Experience Airbnb. This is a miniature version of the famous Boston Cream Pie created at the Parker House. This tour is currently available for private tours only. If you would like to inquire about booking a private tour for your group of 10+ people, please contact us at info@SavorOurCity.com or (954) 410-3177. That concludes Part 1 in Boston. If you wish to continue to Part 2, click on the link to view the highlights of my visit to the Taza Chocolate Factory in Somerville. I was recently invited to attend the Aqua Pool Party, hosted by Utopian Events at the Renaissance Boca Raton Hotel. The Pool Party I attended was on Saturday, Aug. 27th and was open to the public from 12 – 5pm. (More dates will soon be announced). The Aqua Pool Party at the hotel, hosted by Utopian Events, offers guests poolside brunch with selections like Filet Mignon Sliders, Crab stuffed Eggs Benedict and Cali-style Mahi Soft Tacos from 12:00-2:00 pm followed by Barbeque Madness from 2:00-5:00 pm with hamburgers and hot dogs. With Bottomless Mimosas and Bloody Mary’s for $25 and pitchers of Sangria for $18, there are frozen specialty drinks and top shelf beverage specials available all day. Local DJs Alex Gregory and Ben Nigrelli entertained while my friend and I indulged in the wonderful brunch al fresco and later joined in on the poolside games; we even signed up to play in the beer pong tournament (which we unfortunately did not win, but had a lot of fun trying) We did purchase tickets for a chance to win fabulous prizes, including free drinks, food and hotel stays at destinations such as Ft. Lauderdale, Orlando and Chicago as well as a cash prize. A grand prize giveaway includes a two-night stay in Key West in a Presidential Suite with VIP Amenities. Guests gain a complimentary raffle ticket for every $10 spent at the Aqua Pool Party. For more information on the Aqua Pool Party at Renaissance Boca Raton Hotel, please visit the website, twitter and Facebook. BRIO Tuscan Grille South Florida locations are being introduced to a new “Moderno” Take on Tuscan Dining! Have you been to a BRIO Tuscan Grille lately? If not, it’s time to go back and check out all their new offerings. BRIO’s lunch and dinner menus include grilled-to-order steaks, chops, seafood, made-to-order pastas, flatbreads, entrée salads and more…similar to what one would find in an authentic ristorante in Tuscany. The new menu evolves Tuscan-style dining with a variety of new items including small plates for sharing, two-course lunch plates and a renewed and innovative wine, spirits and craft beer menu. BRIO also offers an ample dessert menu, full wine list and cocktail book, special children’s menu, family-style pans-to-go for off-site catered special events, and online ordering. Fusing a creative, culinary-forward attitude with the best of the traditional Tuscan table, BRIO Tuscan Grille locations in South Florida have evolved to launch a new, modern menu of food and drinks. While the menu continues to feature many of BRIO’s time-honored favorites, its ample new additions bring an imaginative twist to Tuscan classics, focusing on fresh, chef-inspired ingredients. Those watching their calories and gluten in take can rejoice as there are an abundant number of low-calorie and gluten-free items on the menu and guests can request customized entrées to ensure that their cuisine of choice perfectly suits their palate. On a recent visit, I had the opportunity to bring my mom with me and we sampled some of the new menu items and some of their classics. One of the highlights of our evening came not served on a plate but the person serving the plates. His name is Kenny and he happens to be one of the VERY BEST SERVERS I have ever had the pleasure of being served by. Kenny had such a pleasant and patient demeanor and a great “can-do” attitude. We will definitely ask for him the next time we are in, and I suggest you do the same! The Kale Caesar was terrific and consisted of mixed greens, marinated kale, pancetta, tomatoes, chopped egg, croutons, Caesar dressing & Parmesan. Maple Balsamic Brussels Sprouts: Roasted Brussels sprouts tossed with capers, a sticky balsamic-maple sauce, crisp bacon, and crunchy pecans, then finished with Reggiano cheese. Mark my words, you MUST order these! If you do not, I assure you that you will be missing out on some of the very best Brussels that have ever been created! Creamed Spinach & Kale: Spinach is tossed with garlic and cream, while the kale provides a surprise of flavor and texture. For more info on BRIO!, to look at their menu , to find a location near you or make a reservation, visit their website, www.BrioItalian.com. BRAVO! Cucina Italiana, its sister restaurant in Jupiter, recently launched a new menu as well, featuring a 2-Course Dinner Menu starting at Only $12.99!!! Be among the first to try their special 2-Course Dinner promotion, showcasing a selection of five entrées paired with one of three salads, available now and running through Friday, Sept. 30, 2016. The 2-Course Dinner Menu features dishes from fresh, cut-from-the-sheet pasta to premium quality meats, chicken and seafood with three always-fresh, high-quality Italian salads. BRAVO! Cucina Italiana at Harbourside Place is located at 149 Soundings Ave., Jupiter, FL 33477. The beautiful 7,098-square-foot restaurant offers indoor seating for guests (including 28 bar seats), and al fresco dining for up to 36 (including six bar seats) on an Italian-style terrace. A semi-private dining area will accommodate groups up to 20 guests. BRAVO! faces the Intracoastal Waterway, which allows the restaurant to provide dockside carryout service. The restaurant is open Sunday 10 a.m.–10 p.m., Monday–Thursday 11:30 a.m.–10 p.m., Friday 11:30 a.m.–11 p.m., and Saturday11 a.m.–11 p.m. Brunch is served on weekends from 11 a.m.–3 p.m. For more information, visit www.BravoItalian.com. For reservations, call the Harbourside Place restaurant at (561) 747-4445.